Kenneth Branagh stars as Swedish detective Kurt Wallander in six feature length dramas based on the best-selling detective series by Henning Mankell - an international publishing phenomenon. The Swedish dream is shattered as a once idealistic Kurt Wallander struggles against a rising tide of violence and corruption in the small town of Ystad in Skane, Southern Sweden - while also facing his own personal demons. 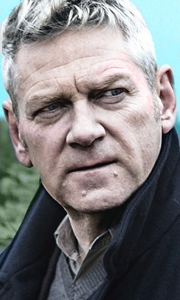 Special Features SERIES ..
Kenneth Branagh (BAFTA award winner 2009) stras as Swedish Inspector Kurt Wallander in twelve feature length dramas based on Henning Mankell's best-selling novels. Our increasingly disillusioned detective struggles against a rising tide of angst and violence in the deceptively peaceful town of Ystad, Southern Sweden. Special Features Who is Kurt Wallander?, Branagh's Wallander, The Wallander Look, Branagh And Makell Interview, Wallande..
Own Wallander Series 1 to 4 Complete Collection DVD from Deff, DVD, Blu-Ray & 4K Video Specialists - Free UK Delivery..
Kenneth Branagh returns to his BAFTA award-winning role as Inspector Kurt Wallander in three new feature length episodes of the acclaimed detective drama based on Henning Mankell's best-selling novels. Having relocated to the Swedish countryside, Wallander's fresh start is crushed when the remains of a young woman are found buried in his back garden in An Event in Autumn. In The Dogs of Riga, Wallander travels to Latvia to assist the Ri..
Kenneth Branagh returns as detective Kurt Wallander for three final thrilling stories based on the acclaimed novels by Henning Mankell. The White Lioness: Wallander is drawn into the case of a missing Swedish national while attending a police conference in South Africa. A Lesson In Love: A woman's body is discovered half buried in the forest swamps. When it transpires the victim's daughter has also gone missing, Wallander must catch the..
Kenneth Branagh plays Swedish detective Kurt Wallander in three new detective dramas based on the best-selling books by Henning Mankell - an international publishing phenomenon with over 25 million copies sold worldwide. Sidetracked, Firewall and One Step Behind follow Inspector Kurt Wallander - a disillusioned everyman - as he struggles against a rising tide of violence in the apparently sleepy backwaters in and around Ystad in beautif..
Own Wallander Series 1 to 3 DVD from Deff, DVD, Blu-Ray & 4K Video Specialists - Free UK Delivery.. In these three new feature length episodes the idyllic tranquillity of Ystad in Southern Sweden is shattered by violence and murder. In Faceless Killers an elderly couple are attacked at an isolated farmhouse and the town witnesses an outbreak of racist violence. Wallander is contacted by an old acquaintance who is suspicious about his father's death in The Man Who Smiled. An elderly birdwatcher falls to his death in a meticulously plan..